This is a summary for McKenna age 19-20 weeks. It was a great week. Let’s get to it! There is a funny thing that McKenna has developed recently. She is at the point where she starts to fuss when you put her in front of you to prep to feed her. Every baby I have seen consistently over time develops this at some point. The baby is perfectly content–until you put her in front of you. Then she is suddenly starving and can’t wait another moment! Something great is that McKenna is at the point where it is really easy to burp her. She basically burps herself. She either burps while she is nursing (in which case I still try to burp her when she is done), or she burps as soon as I move her into sitting position. Waketime length stayed the same this week. There was a development with waketime this week. McKenna is no longer ultra-sensitive to her waketime length. She has probably a 5ish minute flex in her waketime length. Previously, it basically needed to be down to the minute, so having some flex is really nice. McKenna has started the weaning process of dropping the fourth nap. She can’t skip it every day (in fact, most days she can’t), but she can some days. I continue to just keep her up unless/until she needs the nap. If not, we skip it. Nighttime sleep started extending out again and by the end of the week she was back to waking close to our waketime most days. For five of the seven days this week, McKenna didn’t have any solids. We were traveling and I didn’t want to mess with it. But the first day she had it again, she was very excited. She even got to be really good at using the spoon. She has one tablespoon of cereal mixed with one tablespoon of breast milk and one tablespoon of water (purified). I decided I had better use breast milk to mix with the rice. It has enzymes to help break it down, which I think is good. Right now I am just using milk that I pump on Sunday. I feed her a bottle of formula on Sunday while at church. This way I don’t miss any of the meetings while nursing her. It also makes it so she regularly gets a bottle each week. It also makes it so she can have exposure to the taste of formula. I like to be prepared–you never know what lies ahead. When we get home, I pump out the amount she ate at church. That milk lasts me all week! I decided to start trying to have one arm out of the swaddle for all but her morning nap and overnight. It went really well. She did take longer to fall asleep, but still took a really good nap. She was very happy to have one arm out. This weaning process is going quite slowly, but it is going. 10-10:30–dreamfeed (there is no real reason for my dreamfeed to be any later other than I just don’t get around to getting her until later sometimes 😉 ). The weekend of this week was marked with another family reunion. McKenna slept really well, which is nice. She got lots of compliments on how good of a baby and how alert she is 🙂 We did family pictures while there, and the oldest cousin, Brayden, and McKenna were the only children to not lose it at some point during the main pictures 🙂 Kaitlyn can be forgiven since she had missed her nap (as can the other grandchildren for the same reasons). 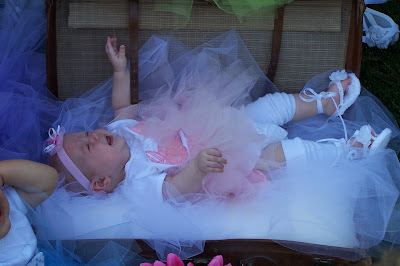 McKenna did lose it when I stuck her in the suitcase full of tulle during the cousin picture (pictured above). I guess she didn’t like that feeling! Hello! I am new to your blog and am enjoying it. I have a now 7 mo old, 5 1/2 mo adjusted… I read BW when he was 5 mo old and wow did it help! We still struggle with a schedule tho. My WAH job takes me away at inconsistent times during the week. Then on Saturdays for 12-16 hrs during the day, when I'm on my feet and its difficult to pump even every 4-5 hrs. Now I am afraid my milk might be getting low as a result of too many of those Saturdays… a question I have for you tho is about nursing and having a baby that sleeps thru the night. How long do you go in bw feedings? Also, what is typical a 7 mo old be sleeping at night? Does that include DF? We do supplement but I'd like to nurse at least a year. I also hate pumping and actually had an LC tell me I'd have to always pump after I nursed, prob bc of my job. Thanks for your help and your blog! I just wanted to comment and agree with the concept of giving occasional formula if you are breastfeeding. Valerie is right – you never know what lies ahead! I had to stop breastfeeding when my daughter was 4 months old, for medical reasons. I had planned to exclusively breasfeed for one year until weaning to cows milk. I am SO glad that I had started giving her formula prior to having to quit BF and go totally formula! What I had to do was for a few months mix the breastmilk and formula gradually until the ratio was much more formula to breastmilk. Another point – make sure that your newborn will take a bottle at room temp!!! I made this mistake of always giving her the bottle warm, and now she refuses it any other way! I too have a baby around this age! He was born April 15th, and I am struggling with SLEEP. I have read and read the posts on sleep problems, CIO, etc, and it seems that we are to the age that if we do any activity other than stay home, he may only catnap or totally miss a nap. Then, the rest of the day is crazy…especially at night. He may cry for an hour (then we go in and give him the paci). It seems that at this stage it may be difficult to ever go anywhere, as now, he won't just sleep in his carseat when we are out and about anymore. He is still taking 4 naps and going down around 7:30 and is up at 9:30 for a dreamfeed. I am wondering, will we ever get to leave the house? I have also been reading Healthy Sleep Habits, Healthy Child, and am having a hard time merging its 9am and 1pm nap with Babywise, especially since it seems like he still needs 4 naps most days. Just looking for some advice on what to expect over the next few months and when I might be able to leave the house again regularly. Friday is fun day with other babies, combined with church, at least one weekend event, errands during the week, the desire to go to the gym, it seems impossible to leave…I am also interested in the answers to Michele's questions…as he is still eating 6 times per day (along with 3 servings of rice cereal/veggies)Ihanks for your insight, and for this blog! At what age do you generally go from 6 feedings (nursing) to 5 feedings? Kratts, At that age, you can go 12 hours between feeds for night, most likely. In your situation, you might let baby sleep through the night, but you pump right before you go to bed (unless baby takes a dreamfeed, then you won't need to). Most 7 month olds who started BW at birth will be sleeping 10-12 hours at night with no dreamfeed. But your baby is 5.5 adjusted. So most 5.5 will be sleeping about 10-12 hours at night also. Many will have dropped the DF but not all.I am glad you like the blog! Thanks Redheads 🙂 And good point about the room temp. We gave stuff to Brayden cold, warm, room temp…and he was never picky. Kaitlyn, however, always wanted it warm. AND she wanted her milk warmed up until a few months ago! Ivy, I personally don't follow the nap schedule for HSHHC at this young of an age. Your baby will naturally get there over time. The BW baby sleeps more than HSHHC suggests. You will be able to leave the house again. But you will have to make sacrifices. Try to not leave during his first nap; let him get that in. You also need to not go out every day…at least until the evening. He should soon go to three naps. Jenna, It varies. This would happen once you drop the dreamfeed. Some drop it as early as a few months old. Some as late as eight months old. You can see the blog label "dreamfeed" for a poll on ages when it was dropped. Hi Val! Love your blog – it has been SO helpful to me to have your example of implementing BW. I have a question regarding my daughter's naps. Right now she's 20 weeks. Our schedule (ideally and used to be) 7/10/1/4/7/DF @ 9:45. She's been STTN since end of Dec.; she does still need the 4th nap most nights. Since she started STTN, her first nap (no matter what I do for waketime length) is only 1 hour long. She'll do a 3/3.5 combo. for the rest of the day and takes real good naps for those naps – about 2 hours long, except the 4th nap, which is only 45 min. to 1 hour. She used to sleep 2-2.5 hours for her 1st nap. I don't get why she stopped doing that. She's not always hungry when she wakes early. Any suggestions? Do I need to drop the DF or the 4th nap? Amber, if you have played with waketime length, then I would probably try dropping the fourth nap to see if that helps. Most babies drop it around 4 months old.But also take into consideration the "wonder week"–see that blog label for details.